TV show dates: September 4, 2018 — present. Performers include: Gabriel Chavarria, Jessica Garza, Hannah Emily Anderson, Colin Woodell, Reed Diamond, Lili Simmons, William Baldwin, Lee Tergesen, Paulina Gálvez, Allison King, Fiona Dourif, and Amanda Warren. From creator James DeMonaco, and based on his feature film franchise of the same name, The Purge TV show is horror series. The drama unfolds in the United States, which is under totalitarian rule. The series revolves around a 12-hour period during which all crimes, including murder, are legal. The story follows several characters who live in a small city. 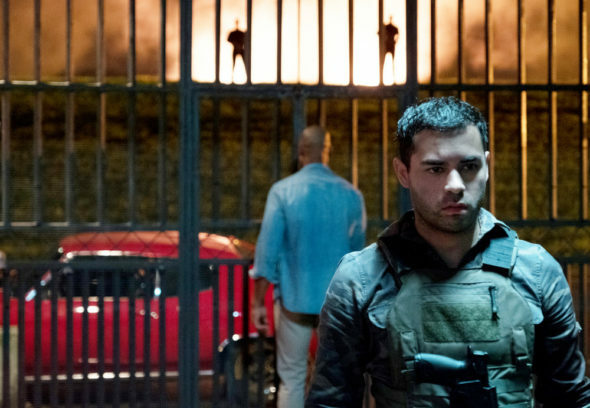 A high-minded and intense US Marine, Miguel (Chavarria) is on a mission. After receiving an unusual letter from his little sister, Miguel returns to town on Purge Night. He’s rough and ready to face the mindless violence to protect his beloved family. Charity-minded Jenna (Anderson) is an anti-Purger who is used to going into lockdown on Purge Night. This is the first year she’s chosen to brave the streets. In doing so, Jenna will have to face some facts about herself and her marriage. Her husband Rick (Woodell) is a self-made man who is finally realizing some measure of social success, thanks to the pro-Purge elites with whom he affiliates. He and Jenna have to decide how far they’ll compromise their principles in order to get ahead in this world. Lila (Simmons), on the other hand, is rich, young, rebel who eschews the pro-Purgers. On the outside, she appears confident and charismatic, but inside, she is a vulnerable person with some unfinished business. Then there’s Jane (Warren), a bright, industrious worker who feels like she keeps bumping her head up against the glass ceiling. Her boss, Don Ryker (Baldwin) is Managing Partner at the investment first. While he acts like he is in Jane’s corner, he could be the biggest roadblock on her path to success. Since Jane hasn’t been able to get ahead through hard work and determination, the Purge presents her with certain options and temptations. Penelope (Garza), meanwhile, is a full-on Purge cultist. She has gone so far as to promise herself as a sacrifice at her leader’s dictate. Much-loved, Good Leader Tavis (Dourif) is cool, if a bit offbeat and all too adept at charming her minions. Finally, there is Joe (Tergesen). Despite his armor and mask, he seems to be an ordinary person driving through town on Purge Night, as he listens to a motivational coach’s lectures on tape. As the clock winds down, all of these people must reckon with their pasts and decide just how far they will go, in order to survive the night. What do you think? Do you like The Purge TV series? Should this TV show be cancelled or renewed for another season on USA Network? More about: The Purge, The Purge: canceled or renewed?, The Purge: ratings, USA Network TV shows: canceled or renewed? Eyewitness: Would You Watch Season Two on USA Network? I enjoy it and so does my family. Please don’t cancel it.